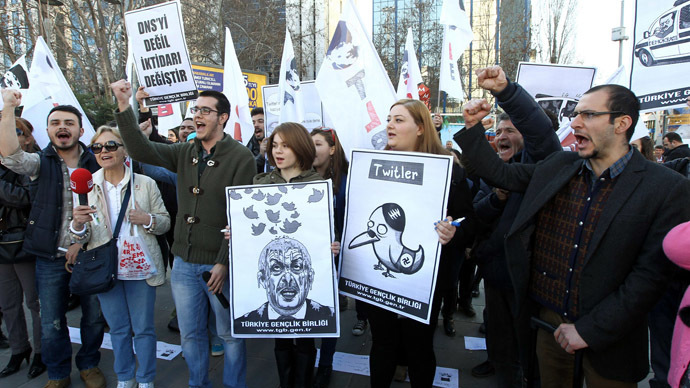 Turkey’s ​block of social media site Twitter on Thursday, and threats to do the same against other sites, has led to outrage among those who see the "digital coup" as a blatant attempt to silence corruption allegations in the run-up to local elections. The Turkish government’s court-ordered block of Twitter has been denounced by many as an attempt to quell allegations of official misdeeds. But the government’s threats have not stopped with Twitter; Google has reportedly declined Turkey’s request to remove YouTube videos that allege government corruption, sources told The Wall Street Journal. Amid a corruption scandal, Turkish Prime Minister Recep Tayyip Erdogan’s government has asked Google in recent weeks to block certain videos from its site in Turkey. Google has reportedly refused to comply, given it believes the requests are legally invalid. After blocking Twitter, the government threatened to do the same with YouTube and Facebook, as the sites have been prime conduits for corruption allegations. Sources said Google sensed that a threat to its services could be imminent after the Twitter block, though as of late Friday, YouTube was still online in Turkey. The videos mainly in question are those that include the alleged recording of a conversation in which Erdogan tells his son to hide money from criminal investigators, a source told The Wall Street Journal. 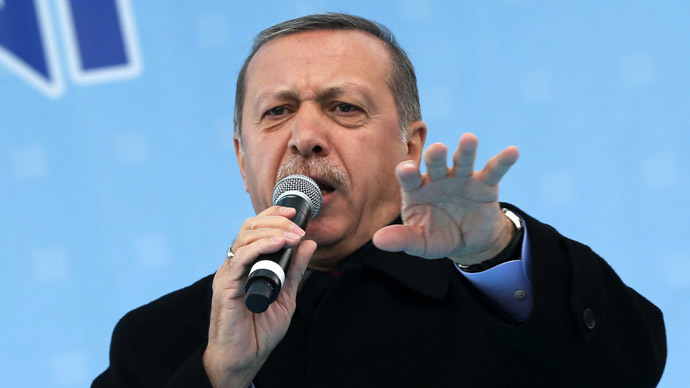 Erdogan has called the popular videos fake, claiming they are part of plans to oust his government. Prior to the Twitter block, Erdogan, while on the campaign trail Thursday, vowed to “wipe out” the social media site, no matter what the international community might think. Turkey faces local elections on March 30. Many in Turkey found ways around the ban, as Twitter published instructions on how to publish tweets via SMS text message. In addition, the hashtags #TwitterisblockedinTurkey and #TurkeyBlockedTwitter were popular across the world. Even President Abdullah Gul challenged the ban and took to Twitter. "One cannot approve of the complete closure of social media platforms," Gul tweeted, putting himself at odds with Erdogan – a fellow leader of the ruling AK Party, which has tightened internet freedoms. However, Gul – seen as a potential successor to Erdogan – has been reluctant to openly defy the prime minister ahead of the upcoming election. Gul’s critics say he’s been too hesitant to challenge Erdogan given his own political ambitions, Reuters reported. Last month, the party pushed a controversial law tightening control over the internet, raising major concerns about free speech. It enabled authorities to block access to web pages within hours without a prior court order. The party is also accused of commanding increasingly more power over the courts and reassigning police, prosecutors, and judges as it fends off corruption allegations. Erdogan calls the corruption accusations a plot cooked up by his political enemies to oust him from power. Turkey’s top opposition party said it would challenge the Twitter ban and file a criminal complaint against Erdogan for violating personal freedoms. The Turkish bar association has also filed a court challenge. Industry Minister Fikri Isik said the block would be lifted if Twitter named a representative in Turkey and agreed to block certain content as requested by the nation’s courts. A company spokesman would not say whether Twitter would appoint a Turkish representative, but did say the company is talking with Turkey. 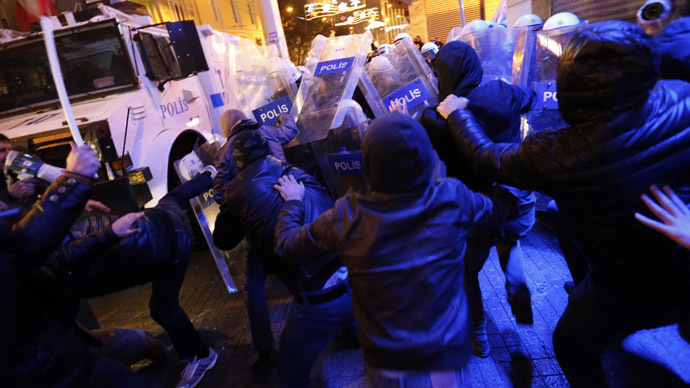 "We stand with our users in Turkey who rely on Twitter as a vital communications platform. We hope to have full access returned soon," the company tweeted. The number of tweets by users in Turkey did not drop after the block, as over half a million tweets were posted in the following ten hours, according to Hurriyet Daily. In fact, many users took to the social media site to roundly mock Erdogan’s attempt to muzzle dissent. Twitter was blocked by the courts after complaints by citizens that the site was a breach of privacy, and because the site had ignored earlier requests to take down content, according to telecoms watchdog BTK. "Because there was no other choice, access to Twitter was blocked in line with court decisions to avoid the possible future victimization of citizens," BTK said, Reuters reported. Turkey’s Twitter block was denounced by European Union Enlargement Commissioner Stefan Fuele, who said the action "cast doubt on Turkey's stated commitment to European values and standards.” Turkey has long attempted to join the EU.